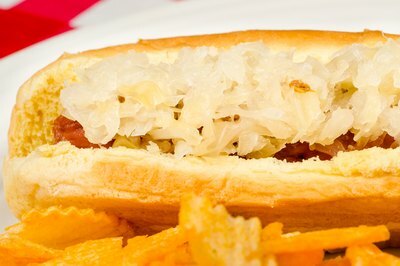 If you love sauerkraut, it's natural to want your favorite topping on hand. But bulk food purchases or an overzealous trip to the German grocer can leave you with more sauerkraut than you or your family could consume in several days. With correct packaging, store-bought sauerkraut keeps well in the freezer for up to two months. Grab your freezer bags, and start scooping. 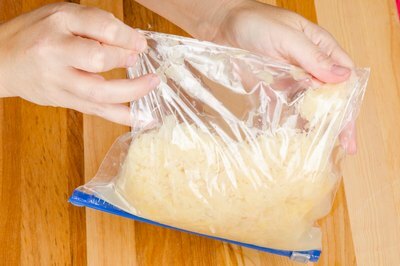 Hold the freezer bag upright with one hand, and spoon the sauerkraut into the bottom of the bag. Use smaller bags for more frequent thawing or larger bags if you plan on performing a mass thawing. Continue holding the bag upright to prevent spilling. Fill the bag to approximately 3 inches below the top seal. Squeeze any excess air from the top of the bag. Move your fingers just above the sauerkraut, and smooth the plastic upward. Seal the opening. Turn the bag upside down over the sink, and shake it gently to test for any leaks or holes. Label each bag with the current date, and insert them in the back of the freezer. Food frozen at 0 degrees F can keep indefinitely, but for optimum taste, you should use your sauerkraut within two months of freezing. Use airtight plastic containers for storage if you don't have any freezer bags. 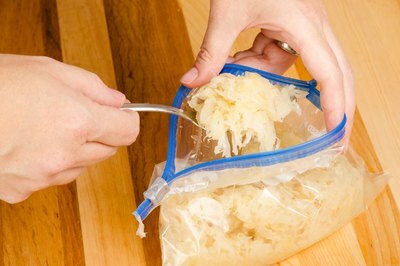 MissouriFamilies.org: Food Safety: Can I Freeze Sauerkraut? What Can I Do With Leftover Pork & Saurkraut?